Ramsey, NJ (October 18, 2007) – At Gitzo, performance and quality is a way of life. Since 1917, unfailing standards have maintained the company’s worldwide reputation for excellence in the photographic industry, and to celebrate 90 years of innovation, Gitzo is proud to offer the world a once in a lifetime opportunity to own one of the most exclusive, state of the-art, professional tripods ever made – the 90th Anniversary Gitzo Titanium Traveler. Only 390 will be manufactured, each individually numbered and with the owner’s name laser engraved into one of the carbon fiber legs. 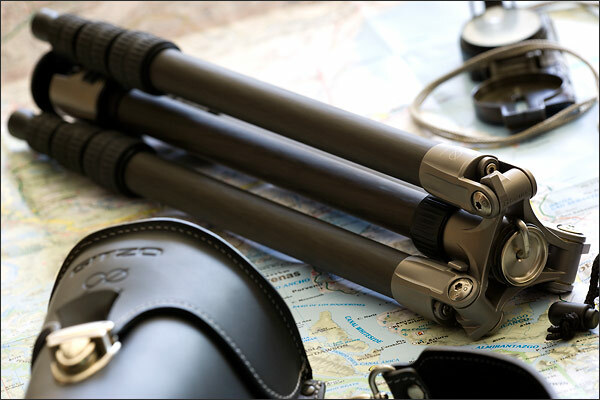 To add the finishing touch, the Titanium Traveler will ship in an Italian crafted fine leather case and include a special leaflet outlining the technology and engineering that went into the design and manufacture of this unique tripod. During PhotoPlus 2007, customers may enter a drawing to win one of the 390 90th Anniversary Titanium Travelers at the Bogen Imaging booth, # 436. Bogen Imaging is the distributor of Gitzo products in the United States. The unique Traveler design is highlighted by its revolutionary and exclusive 180 degree folding mechanism that allows the user to accommodate the extra length of the head inside the folded legs. The Traveler is the most compact, full size professional tripod available today. With upper castings made of 100% pure titanium, the 90th Anniversary Traveler truly expresses the Gitzo spirit of quality and performance. One of the most superior, highest performing metals available in the world, titanium is extremely lightweight and is renowned for its strength. The titanium castings are finished with a high performance process used for surgical equipment that guarantees to eliminate all micro porosities and micro peaks, making the surface completely smooth and impenetrable by impurities and corrosive agents at the microscopic level. Additionally, the natural beauty and color of titanium gives the 90th Anniversary Traveler an impressive look that demands attention. Furthermore, the 90th Anniversary Traveler features a redesigned head, also crafted from titanium, and a vibration reducing upper disc material. The Titanium Traveler also includes Gitzo’s new Ground Level Set. For ultra-low shots in a matter of seconds, users now have the ability to attach the upper disc directly to the upper casting. By simply unscrewing the upper disc, bolt and center column hook, users can effortlessly remove the column and reattach and lock in the upper disc directly to the tripod. This clever built-in solution dramatically increases the Traveler’s flexibility and allows for ground-level shooting angles, weight reduction and increased stability. The new 90th Anniversary Titanium Traveler also boasts Gitzo’s advanced 6X carbon fiber structure and G-Lock technology, a feature not found on a standard Traveler tripod. The new G-Lock – or gravity lock – mechanism represents Gitzo’s evolution of the twist lock system. The completely revised locks are faster, stronger and 20 percent more rigid than standard twist locks. Year after year, Gitzo has improved upon standard twist lock technology and with the introduction of G-Lock, has positioned itself once again as the market leader and standard setter. G-Lock features a unique cone shaped ramp and locking ring that creates a “gravity locking” effect within the tripod leg. The heavier the weight applied to the legs, the stronger the locking effect is, resulting in a rock-solid tripod structure that significantly minimizes the bend and give associated with carbon fiber. Backing the advanced G-Lock technology is Gitzo’s Anti Leg Rotation (ALR) system. The ALR system allows for a fast and smooth setup and fortifies the uncompromised locking strength of the new twist lock system. Users just loosen all twist locks at the same time and pull down the leg before tightening them, making setup a mere 15 seconds for a five sectioned tripod. Overall, compared to a standard Gitzo Traveler, the 90th Anniversary Titanium Traveler offers double the maximum payload as well as torsion rigidity that is three times greater. The maximum load capacity of the Titanium Traveler is 17.6 pounds (8 kg) and the maximum load capacity of the redesigned titanium head is 8.8 pounds (4 kg). Gitzo products are distributed exclusively by Bogen Imaging in the United States. For information, contact Bogen Imaging at info@bogenimaging.com or (201) 818-9500. Additional information regarding the 90th Anniversary Titanium Traveler can be found at www.bogenimaging.us. Bogen Imaging Inc is a leading distributor of key accessories brands for the photographic, video, cine and lighting production markets. Bogen is an international company within the Imaging Division of the Vitec Group, which owns the following leading, international brands: Manfrotto, Gitzo, Kata, National Geographic bags and Tripods, Avenger, and I.F.F. As the exclusive US distributor of Metz, Gossen, Elinchrom, Lastolite, Reflecmedia and Formatt Filters, Bogen offers the most complete range of exceptional camera and lighting accessories in the business. The Bogen Imaging international network covers the USA, Germany, France, Italy, UK and Japan.